"I shall do one thing in this life-one thing certain-this is, love you, and long of you, and keep wanting you till I die." Far From The Madding Crowd is the new talked-about movie from Fox Searchlight starring Carey Mulligan as Bathsheba Everdene. This is the original 1874 romance novel by Thomas Hardy, complete and unabridged. In Victorian England, the independent and headstrong Bathsheba Everdene attracts three very different suitors: Gabriel Oak, a sheep farmer; Frank Troy, a reckless Sergeant; and William Boldwood, a prosperous and mature bachelor. Alive with lush, idyllic settings that exert profound influences on the novel's characters, it is an unforgettable narrative of both beauty and devastation. 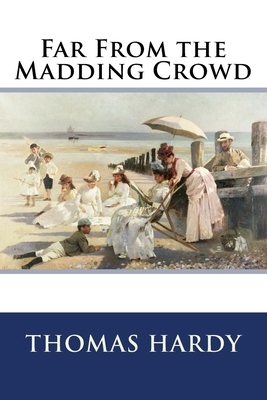 Its portrait of rural life, and compelling examination of social conventions, has made Far From The Madding Crowd one of literature's classic romances. Thomas Hardy (1840-1928) was an English novelist and poet. A Victorian realist in the tradition of George Eliot, he was influenced both in his novels and in his poetry by Romanticism, especially William Wordsworth. Charles Dickens was another important influence. Like Dickens, he was highly critical of much in Victorian society, though Hardy focused more on a declining rural society.